This past month we have been busy with our reading. D is starting to enjoy reading the words himself and takes much more interest in the writing that is on the pages rather than the pictures in the story. He does still enjoy the pictures and will point out certain things in the pictures, usually something that amuses him. We have changed they types of books we are reading during the day for this reason. We have still been reading stories that are a bit longer but not as many. We are reading shorter stories with fewer, easily recognised words and sometimes repetitive in the words or phrases. D is enjoying these types of books because he has a role to play in the reading and the words become familiar to him the more we read the books. He is recognising the words repeating in one book while we read another. He is very enthusiastic about reading and loves being able to have a read for himself even if it is just one or two words in a sentence. 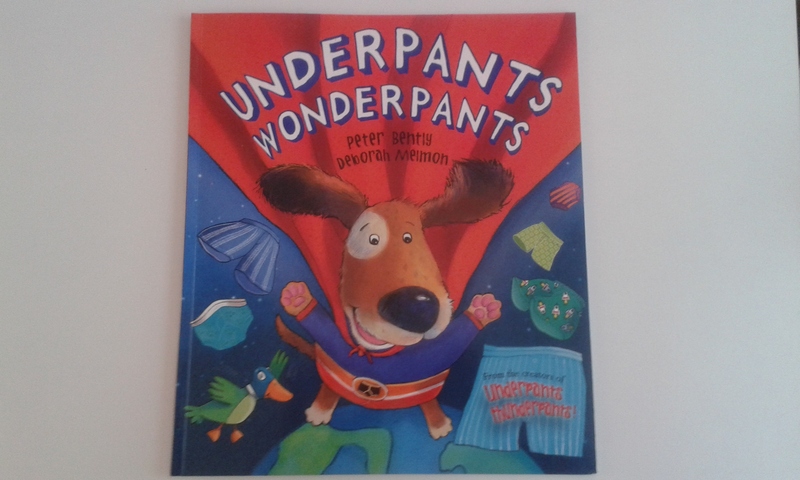 Our favourite book this month has been Underpants Wonderpants written by Peter Bently and Illustrated by Deborah Melmon. Underpants Wonderpants is about a dog who is a superhero called Wonderpants. He saves the day in a very unique way, he uses underpants to solve any problem his friends might have. Underpants Wonderpants is perfect for this stage of reading, it is engaging, easy to read with large writing and clear font. D loves it, Wonderpants can do just about anything with a pair of underpants. There are many problems that solves in the book with some underpants. All of which are very creative, he makes a fishing net, a house for mice, a parachute among many other things. Every problem that he solves is inspiring and outside of the box, I think this is very important in a story for young children. Having so many creative and inspiring ideas inside the book is perfect, D has just started to enjoy pretend play through dressing up and being a superhero who saves the day. Since we have been reading Underpants Wonderpants I have noticed a change in the ideas he has regarding how he has to save the day. It's no longer just D 'flying' around the room and saving a toy or teddy from falling down a big mountain or a similar scenario. He is engaged with pretend play and engrossed in the story behind why his toys and teddies need saved, not only why but how too. I've heard and watched him come up with his own creative ways to save them. I think this is mostly thanks to the creative use of underpants in the book. Deborah Melmon's artwork in the book is beautiful and depicts the story well. 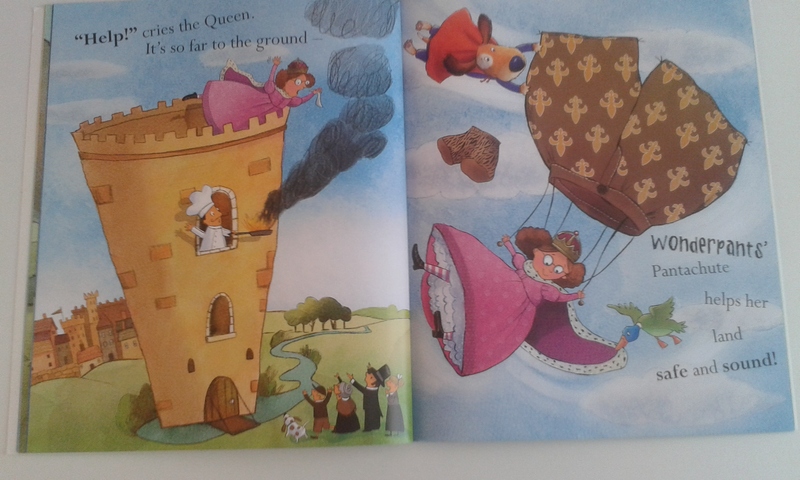 The pages are all brightly coloured with fun and detailed characters. The house for the mice made of underpants has straw stuffed inside and is made of levels with a little ladder and even has a clothes line on top. You can tell she really put thought into each picture on every page. The details in some of the pictures even shows where the underpants are sewn together to create the items needed to help the animals and people. D really enjoys reading Underpants Wonderpants and honestly so do I. Usually it is hard to keep D entertained with books that don't take that long to read as they are simply too short but Underpants Wonderpants is different and that is partly due to him trying to read the words with me and learn how to read it himself. This is drawing out the story and engaging him in what is happening more. It is also thanks to the story itself, he loves superheros and this one is certainly a great one! What child doesn't love pants? Whether or not your child is learning to read this is a great book. 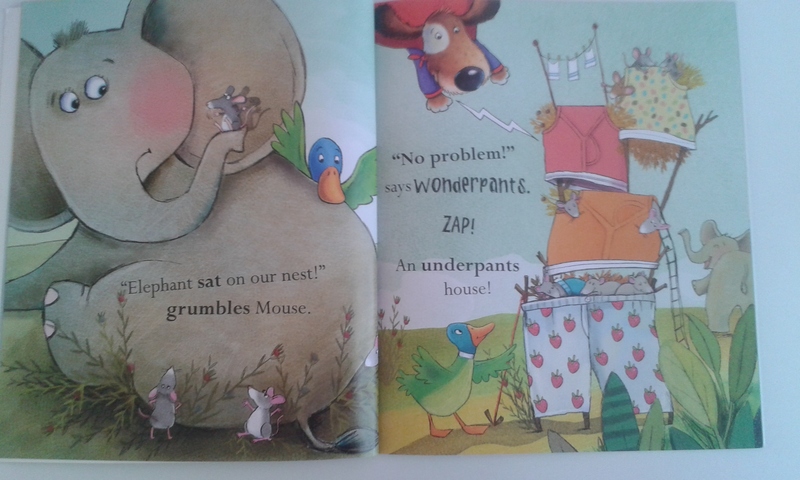 We have all enjoyed the story and the illustrations in Underpants Wonderpants. It is a perfect book for the very early reading stage and it inspires creative thinking in the reader or readers. I would certainly recommend this to be added to any toddlers library who enjoys superheros or underpants. You can find Underpants Wonderpants written by Peter Bently on Amazon by clicking the link. The book for £5.99. You can check out any of our previous What We're Reading posts by clicking on the link. What have you been reading this month? I would love to hear what you thought about books you have enjoyed.